For the third straight year, the Ivy League Offensive Player of the Year will come from Princeton. Who is it? Well, that won’t be determined until next week. 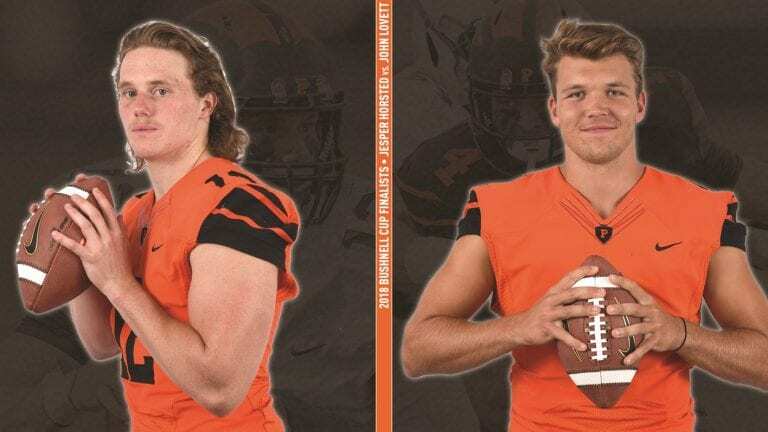 Princeton seniors Jesper Horsted and John Lovett were named the two finalists for the 2018 Asa S. Bushnell Cup as the Ivy League Offensive Player of the Year on Tuesday; the winner will be announced at a special reception and press conference presented by the Pasadena Tournament of Roses in the Mercury Ballroom of the New York Hilton Midtown beginning at 12:30 p.m. on Monday, Dec. 3. That ceremony will be streamed live on ESPN+. Since the Ivy League began announcing the two finalists for Player of the Year awards in 2011, this is the first time one team has had both for the same honor. 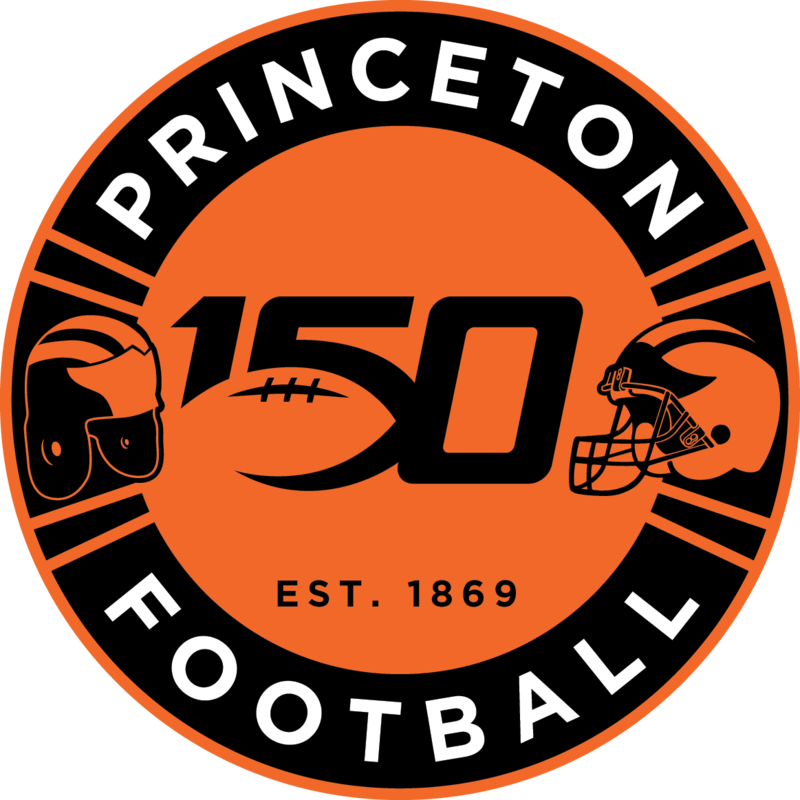 It is fitting for Princeton, which broke its own 2013 league record for points scored in the season and ranked first among the Ivies in total offense (536.8 yards/game), scoring offense (47.0 points/game) and rushing offense (295.5 yards/game); even Princeton’s passing offense ranked second in the Ivy League at 241.3 yards/game despite the fact that it spent the second half of several games running the ball with significant leads. Lovett could make some history of his own, as he looks to become only the fifth player in league history — and the first from Princeton — to earn multiple Bushnell Cups. Lovett was named the 2016 Ivy League Offensive Player of the Year after setting a program record with 20 touchdown runs during Princeton’s championship season. He missed the 2017 season due to injury, though teammate and current Arizona Cardinal Chad Kanoff ’18 had a record-setting of his own to claim the 2017 Bushnell Cup. Other two-time winners include: Ed Marinaro (Cornell, 1970-71); John Pagliaro (Yale, 1976-77); Carl Morris (Harvard, 2001-02); and Zack Hodges (Harvard, 2013-14). The first three each won during the era of only one Bushnell Cup winner, while Hodges was a two-time Defensive Player of the Year, though he shared the 2014 honor with Princeton linebacker Mike Zeuli. Horsted is looking to be the first wide receiver to win the Bushnell Cup since 2009 (Brown’s Buddy Farnham), and only the fourth different wide receiver to claim the award, joining Morris and Brown’s Sean Morey. The Ivy League Defensive Player of the Year finalists are Stone Hart of Harvard and Isiah Swann of Dartmouth.